World highest individual score Record by one and only indian " Sachin Tendulkar " . Today our master Blaster Blasts the world records by his Double century Sachin Tendulkar is First Double century in world. Master Blaster became the first batsman to score a double century in one-day internationals on Wednesday . Century was against South Africa in the game overseas, 2nd came as close to 100 balls and was in honor of the skills and cunning of the Blaster Master. 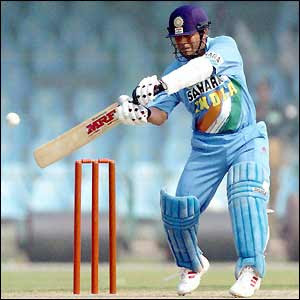 After the completion of a century, Tendulkar did not relax and continued to fire with all cylinders.There was pin drop silence on the ground as Tendulkar was near double century with a crowd was waiting impatiently for him to complete the double century atheist in one day cricket, a feat unachieved in the game.Captain Mahendra Singh Doni Tendulkar ably assisted in reaching the highest degree in the history of one day cricket.Congratulations to the master a little, its highest rate in the one-day cricket and it is hoped to repeat the same game in the next world cup.